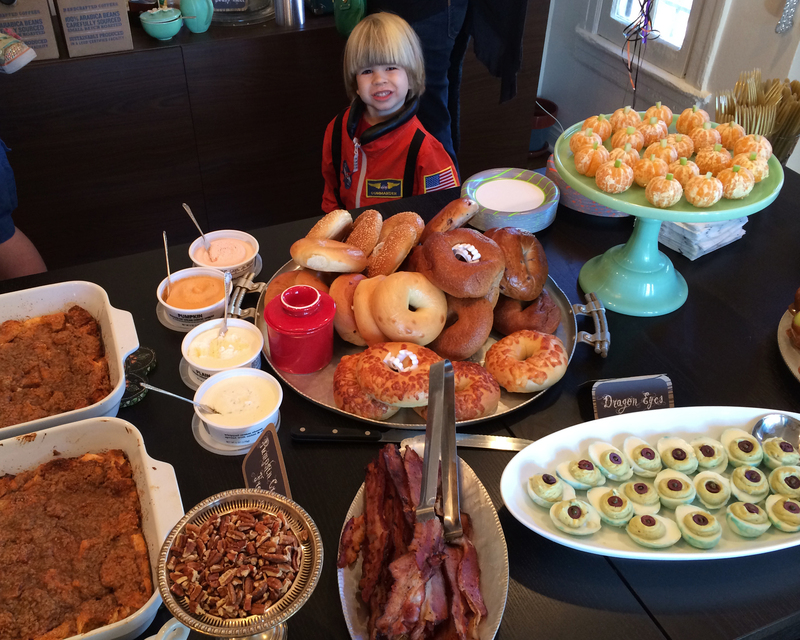 A tiny astronaut checks out the brunch buffet. Last Halloween, we had a small, low-key brunch for G’s friends the morning after trick-or-treating so that everyone had one last opportunity to show off their costumes. 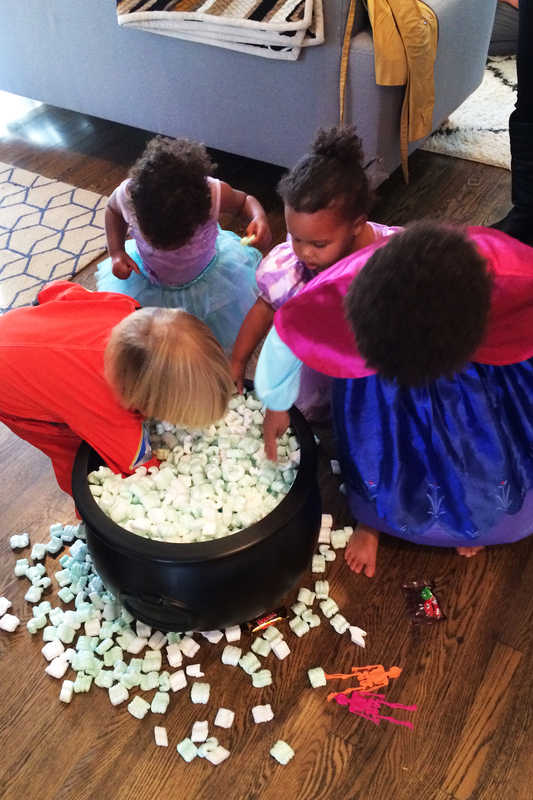 Halloween can be a tough time for parents of toddlers and little kids because of all the gruesome stuff they are suddenly exposed to. It’s hard to explain what a zombie or witch is to a small child and then to have to explain that it’s just fake and for fun…That can be pretty overwhelming for a 2 or 3-year-old to understand. 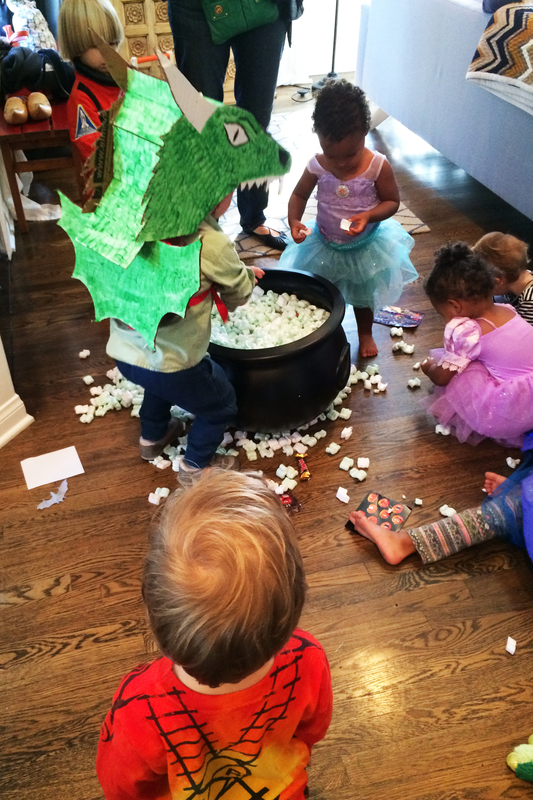 We set out to throw a party completely free of spooky stuff that was still festive but also super easy. When you’re throwing a brunch party, your last-minute prep is limited to when you feel like getting up, so keep that in mind when prepping your menu! Here’s what we did last year. 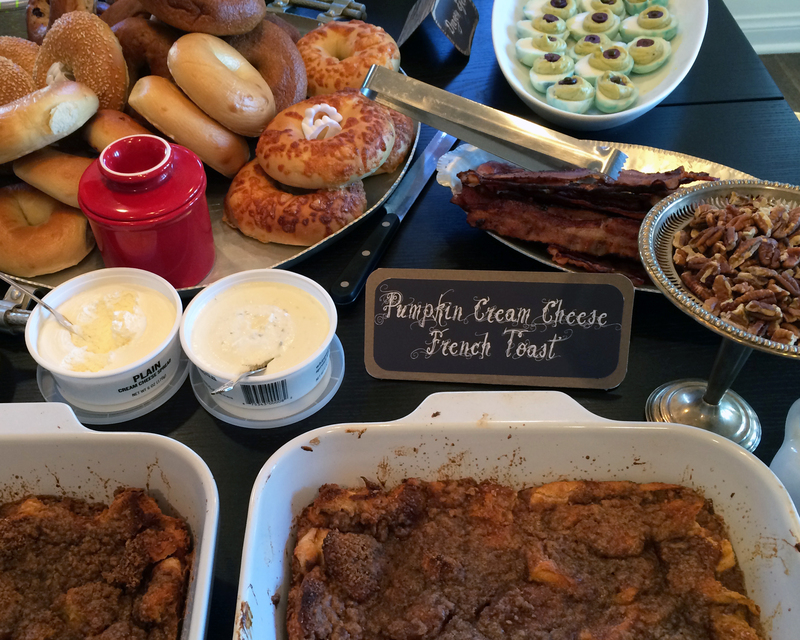 Bagels and pumpkin cream cheese french toast were our brunch staples. Make sure to keep any nuts separate at a kids party! 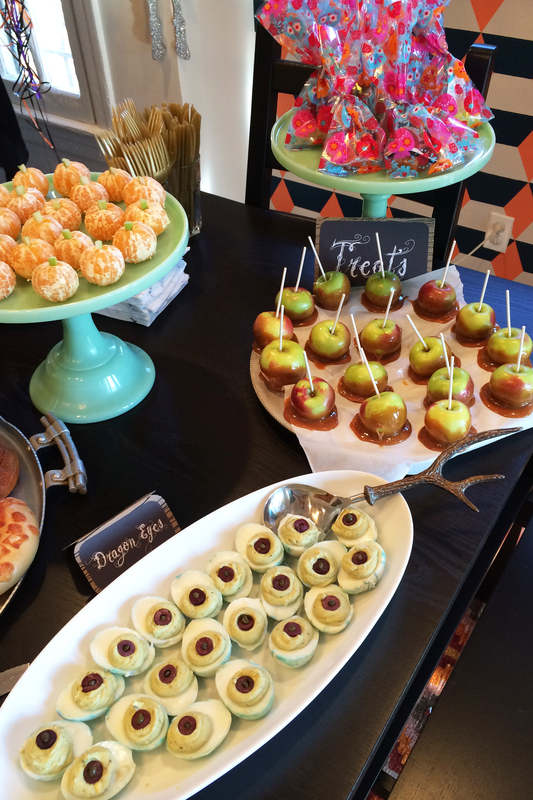 We added avocado to dyed deviled eggs to give them a dragon-y green tinge and olives for pupils. Peeled mandarins with a bit of celery look just like little pumpkins and half-dipped caramel lady apples are easier on small mouths and bellies. 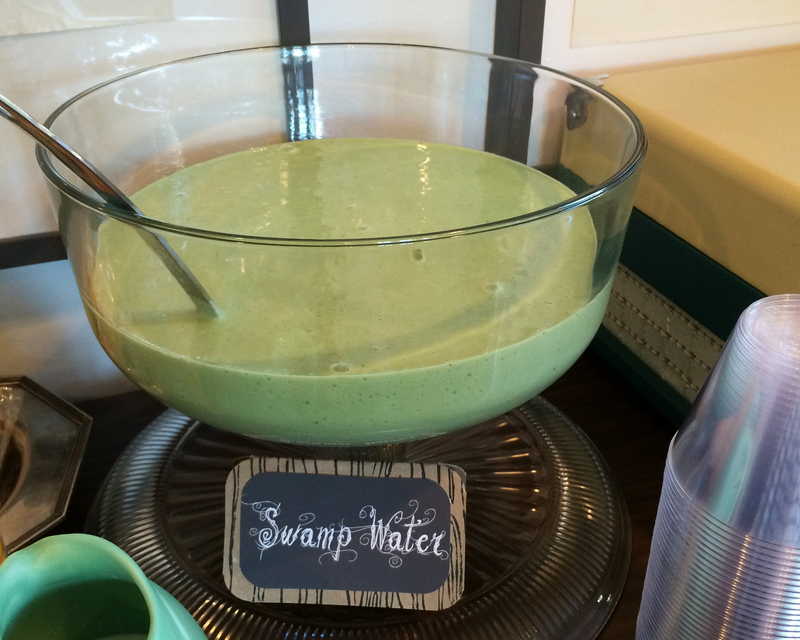 Add some kale or spinach to any smoothie recipe and call it swamp water! Still kid friendly but also pretty healthy and delicious. My co-hostess brought this brilliant Halloween game for little kids. 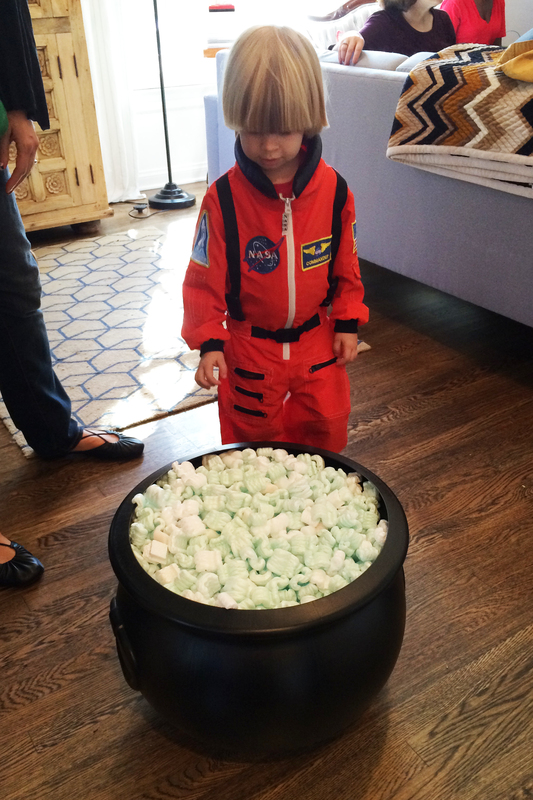 Fill a plastic cauldron with little treats and green packing peanuts and then let the kids go crazy trying to grab the stuff in there! Madness and mess ensue. So fun!